The Swagger 2.0 specification was officially released today and at StrongLoop we are excited to announce that LoopBack is the first Node.js framework to support Swagger 2.0. Using LoopBack you can now take a Swagger 1.2 or 2.0 specification and automatically scaffold a Node-powered REST API. This should be especially useful for any developer wanting to easily describe their APIs using the leading enterprise standard for API specification and implement them in Node.js. Developers now have the ultimate flexibility in starting from a “bottoms up” approach – building APIs from existing data sources or a “top down” approach – starting with the leading enterprise API specification and scaffolding up a backend of generated models. We were invited by the project lead Tony Tam, to participate in the Swagger 2.0 workgroup a few months ago, which also included other leading API vendors like Apigee, 3Scale, PayPal and Microsoft. The Swagger 2.0 specification is a great win in the effort to build APIs for the enterprise and to describe them in a uniform way so that they can be utilized by end users and developers. We’d like to congratulate everyone on all the hard work that went into this release! If you are new to Swagger, it defines a standard, language-agnostic interface to REST APIs which allows both humans and computers to discover and understand the capabilities of the service without access to source code, documentation, or through network traffic inspection. What about starting with an API design specification? API consumers and providers often want to discuss, understand, and agree on the APIs as a contract first, before building code for either the client or server. 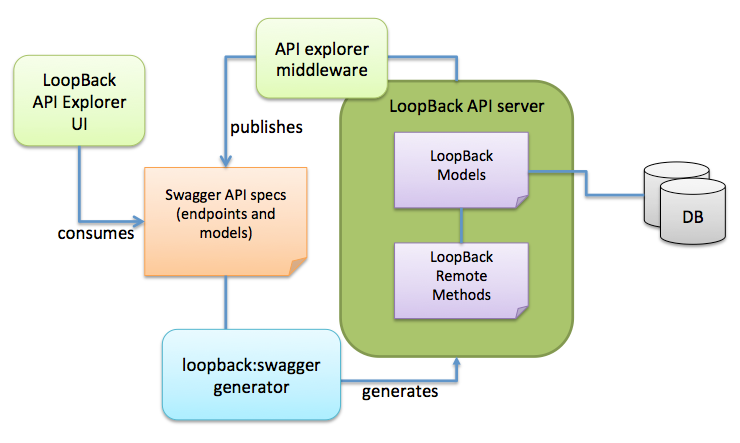 To support a API design first approach, we’re excited to announce the availability of the loopback:swagger generator which can generate a fully-functional application that provides the APIs conforming to the Swagger specification. In the next few sections of this blog we’ll show just how easy it is to create Node powered REST APIs that conform to the Swagger 2.0 specification using the LoopBack framework. The first step is to create a blank LoopBack application. 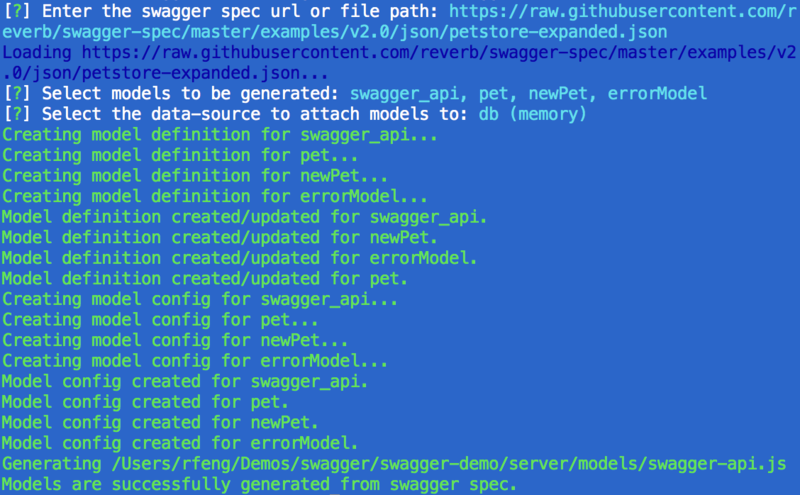 Now let’s try to generate APIs from Swagger specs. The generator loads the spec and discovers models and apis. It then prompts youto select from the list of models to be created. Please note pet/newPet/errorModel models are now connected to the database selected. Open your browser and points to http://localhost:3000/explorer. As you see, the API endpoints defined by the Swagger spec is now available from LoopBack! You’ll also see a list of models generated too. As illustrated below, these models have the full CRUD capabilities and can be attached any of the databases that LoopBack supports. Hmm, you get an error saying the api is not implemented. That is expected as the generated method is just a skeleton! How about adding your implementation? 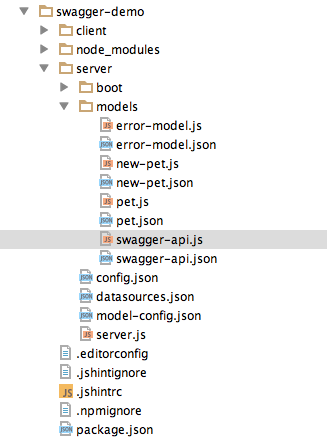 The file can be found at swagger-demo/server/models/swagger-api.js. Try getPets. You’ll see an empty array coming back. Try addPet to post one or more records to create new pets. Try getPets again. You’ll see the newly created pets. Try findPetById. You should be look up pets by id now. Try deletePet. Pets can be deleted by id. You can also use the pet model directly. It will provide you the full CRUD operations. Please note in 1.2, the spec URL can be the resource listing or a specific API specification. 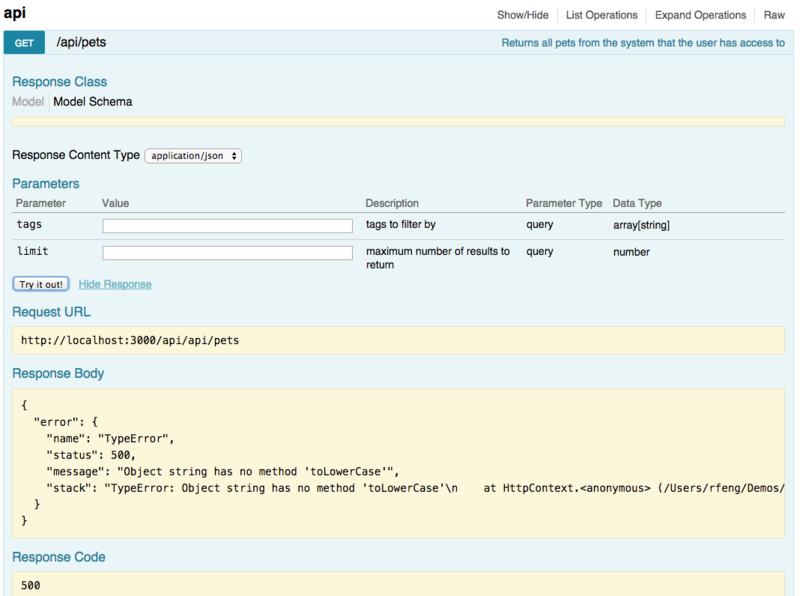 For resource listing, all API specifications will be automatically fetched and processed. Ready to develop APIs in Node.js and get them connected to your data? Check out the Node.js LoopBack framework>. We’ve made it easy to get started either locally or on your favorite cloud, with a simple npm install.